November 2018 update: Interactive Google map of all waterfalls. A unique aspect of the geologic history of the Columbia River Basin is the volcanism that raised the Cascade and Rocky mountains and shaped interior parts of the basin, confining the river in steep valleys and broad canyons later scoured by Ice-Age floods. It is a landscape prone to dramatic waterfalls. In places, particularly in the Columbia River Gorge, many spectacular waterfalls plummet over steep, rocky ledges. Some run year-round, some run heavy during the spring runoff but are barely more than trickles at other times of the year, and some never flow constantly from top to bottom but turn to mist in mid-air, leaving green streaks of tenacious vegetation on the sheer canyon walls. By region, here are some of the more spectacular waterfalls that fall into or near the Columbia River. Takakkaw Falls, which plunges 1,250 feet (381 meters), is one of the most spectacular waterfalls in the Rockies and the second-highest waterfall in Canada. The falls is in Yoho National Park, which is known for its extensive trail system and views of glaciers. Takakkaw means “magnificent” in Cree, and the falls is appropriately named. Access is through the Kicking Horse River Camp Ground, which is about 8.7 miles (14 kilometers) north of the Transcanada Highway where it passes through Field, which is east of Golden. From Takakkaw Falls four more waterfalls can be visited in a distance of 5.2 miles (8.3 kilometers) along the Yoho Valley Trail: Point Lace Falls, Angel's Staircase, Laughing Falls, and Twin Falls, which is 260 feet (79.2 meters) tall. Wapta Falls also is near Golden in Yoho National Park. West of Field along the Transcanada there is a signed turnoff for the falls. The trail, about two miles round trip, is an easy hike to the falls and back. Wapta is the largest waterfall in the park and the third largest in Canada, by volume, but it is not nearly as tall as Takakkaw. Nonetheless, it is a beautiful sight. Of all the waterfalls in the Columbia River Basin, the largest no longer exists. But its remnant does. Dry Falls once coursed over a rocky escarpment in eastern Washington carrying the entire flow of the Columbia when an ice dam choked the river at the present-day site of Grand Coulee Dam. Another Ice-Age relic, Palouse Falls, continues to flow. On the Palouse River six miles north of its confluence with the Snake River, Palouse Falls is about 200 feet (61 meters) tall and a spectacular site in the desert-like country in this part of eastern Washington. A state park and campground are located on the plateau above the falls. The falls plummet into a semi-circular canyon of basalt; 100-foot-thick lava flows can been seen on the canyon walls. The park is 23 miles southeast of the town of Washtucna. Multnomah Falls, about 30 miles (48 kilometers) west of Portland, is a twin falls totaling 611 feet (186 meters). The main falls is 542 feet (165 meters), and the lower falls is 69 feet (21 meters). There is an historic lodge, which includes a restaurant and gift shop. Trails lead to near the base of the falls, which can be viewed from several locations including a lovely old arched concrete bridge. Access is from either Interstate 84 or the Columbia River Highway. Latourell Falls, 249 feet (76 meters), is in Guy W. Talbot State Park along the Columbia River Highway, 3.4 miles (5.4 kilometers) west of Exit 28 of Interstate 84. 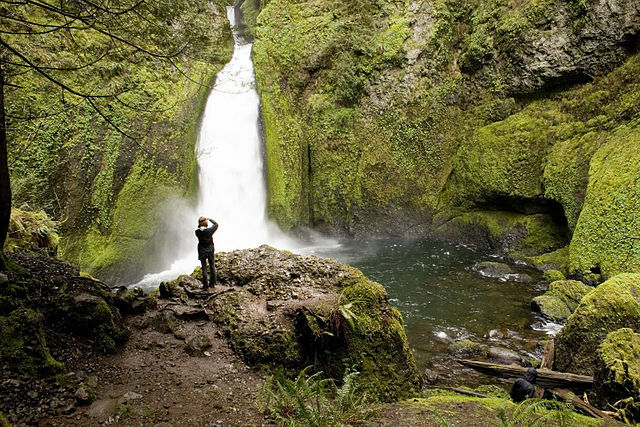 Upper Latourell Falls, 75-100 feet (23-30 meters), is a little less than a mile along the trail from Latourell Falls. This one is interesting because, like upper Horsetail Falls farther east in the Gorge, the trail leads behind the falls. Bridal Veil Falls, 60-100 feet (18-30 meters) in the upper falls and 40-60 feet (12-18 meters) in the lower falls, is about a mile west of Exit 28 from Interstate 84 along the Columbia River Highway. There is a short trail to the base of the lower falls. Shepperds Dell Falls, 35-50 feet (10-15 meters) in the upper falls and 40-60 feet (12-18 meters) in the lower falls, is in Shepperds Dell State Park two miles on the Columbia River Highway from Exit 28 of Interstate 84. Wahkeena Falls, 242 feet (74 meters), is at the Wahkeena picnic area about a half-mile west of Multnomah Falls. About a mile up Wahkeena Trail No. 420 from the picnic area is Fairy Falls, 20-30 feet. Triple Falls, 100-135 feet (30-41 meters), is on Oneonta Creek about 2 miles up the Oneonta Trail No. 424. The trailhead is about a mile east of Multnomah Falls. Horsetail Falls, 176 feet (54 meters) is 2.5 miles (4 kilometers) east of Multnomah Falls along the Columbia River Highway. The falls is practically at the roadside, and a turnout offers a good view. There also is a trailhead that links with the Oneonta Trail for a round trip of about four miles. The trail climbs steeply at first but then levels and affords sweeping views of the Columbia and the Gorge. Wahclella Falls, 15-25 feet (4.5-8 meters) upper and 50-70 feet (15-21 meters) lower, is on Tanner Creek, which is accessible by a trail from Exit 40 from Interstate 84 (the Bonneville Dam exit). The trail head is clearly marked, and from the parking area is it a half-mile hike to falls. Metlako Falls, 100-150 feet, is on Eagle Creek. The Eagle Creek Trail No. 440 is accessible from Exit 41 from Interstate 84. A viewpoint for the falls is 1.5 miles up the trail. Punch Bowl Falls, 10-15 feet (3-4.5 meters), also is on Eagle Creek, and is another half mile past the Metlako Falls viewpoint. Here the creek narrows and then shoots into a natural basin, as if the water being poured into a punch bowl. Hardy Falls, 80-120 feet (24-36.5 meters), located on the Hamilton Mountain Trail, which begins at the upper (north of the highway) picnic area at Beacon Rock State Park. The park is on Washington Highway 14 about 35 miles (56.3 kilometers) west of Vancouver. Or, from Interstate 84 on the Oregon side, take Exit 44 at Cascade Locks, cross the Bridge of the Gods, and then go west seven miles (11 kilometers) to the park. Take the trail 1.25 miles (2 kilometers) to an intersection of two spur trails. The upper trail leads to a viewpoint. Falls Creek Falls, 275 feet (84 meters) in three tiers, located west of Big Lava Bed 16 miles (26 kilometers) north of Carson, off Forest Road 3032, which is marked with directions to the trailhead. Follow signs to the lower trailhead. The falls can be viewed from several locations after a hike of about 1.5 miles (2.4 kilometers). Willamette Falls is on the Willamette River at Oregon City, about 10 miles (16 kilometers) south of downtown Portland, Willamette Falls is the biggest waterfall in the Northwest in terms of width and volume. The entire Willamette River drops about 42 feet (13 meters) here, depending on the time of the year and the volume of the river. Willamette Falls is the site of a historic Indian salmon fishery. Pioneers built a canal and locks so steamboats could pass, and the falls also is the site of one of the first hydroelectric dams in the Northwest, completed in 1895. The first long distance transmission of electricity in the US took place here running to Portland in 1889. The falls can be viewed from several locations at Oregon City, including the Museum of the Oregon Territory.